US, 2003, 103 minutes, Colour. Frankie Muniz, Hillary Duff, Angie Harmon, Keith David, Cynthia Stevenson, Arnold Bosloo, Ian Mc Shane, Daniel Roebuck, Martin Donovan. 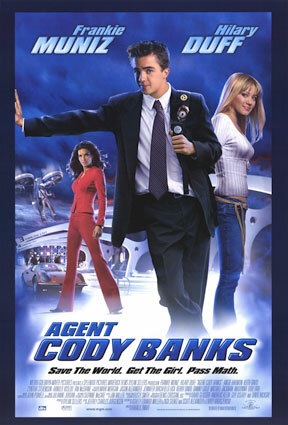 Cody Banks is an entertaining adolescent version of James Bond adventures. Over forty years saw many James Bond stories but even more parodies and imitations. This is the junior version. The Cody Banks films could be likened to Robert Rodriguez’s Spy Kids series – although it does not have quite the amount of tongue-in-cheek adventure, special effects, action stunts. Frankie Muniz comes from the television show Malcolm in the Middle. He is joined by Hillary Duff, TV actor as well as popular singer and, in later years, movie star. The film has a very strong adult supporting cast with Angie Harmon, Keith David as the director of the CIA with Ian Mc Shane as the villain and Martin Donovan as the heroin’s father. The film combines some of the styles of television series about awkward teenagers, going to school, making mistakes, parties, along with the Bond-style action adventure. The film was directed by Harald Zwart, director of One Night at McCools? with Matt Dillon and Liv Tyler. 1.The popularity of Frankie Muniz, Malcolm in the Middle and TV appearances? Movies and the sequel to Agent Cody Banks? The youngster, adolescent problems, the possibility of an adolescent being a super spy? 2.Seattle, the CIA headquarters, the laboratories? The schools? Authentic locations – with the fantasy of CIA work? The musical score and songs? 3.The title, the focus on Cody? As a fourteen-year-old, his place in the family, the portrait of his parents and their concern for him? His brother and his being cantankerous? Cody and his shyness? His being recruited by the CIA? His mission: Natalie Connors, at school, her scientist father, his connection with the crime organisation, Brinkman? His training, being supervised by Ronica? In school, his awkwardness, gaffes in class, not being able to communicate with Natalie? His saving her, going to the birthday party, his mission to check on Dr Connors? 4.Cody as spy: the credibility, his saving the child at the beginning of the film? Getting out of awkward situations at school – despite the pitfalls? At the party, his discoveries about Dr Connors? 5.The crime organisation, ERIS, Brinkman as heading it? The nanotechnology, the laboratories? The experiments? Dr Connors and his being forced to work there, his fears for Natalie? Cody and his infiltration? Discovery about the technology destroying solid objects? Brinkman and the aim to destroy American missiles? Brinkman and his threat to Natalie? Cody taking a sample – Brinkman, his suspicions, removing Cody from the work? 6.Cody, his going to meet Natalie, the relationship with Natalie? His shyness? Natalie and her personality (especially as played by Hillary Duff)? 7.Ronica, her screen presence, the effect on the boys, their talk, embarrassment when she winks at them? Her supporting Cody? 8.Brinkman and the kidnapping of Natalie? The CIA director, his orders? Cody tracing Natalie, the mountains, the headquarters? Ronica coming also, her disobeying the superiors? Cody and Ronica and their being captured, the escape? 9.The explosive finale – the devices going up in flames? Brinkman’s death? Cody and Ronica rescuing Natalie, rescuing Dr Connors? 10.Cody as a hero, the CIA and its award to him? His own satisfaction – in kissing Natalie? 11.The tradition of the James Bond films, the parodies of these? The spy kids adventures? The American belief in the CIA, secret agents and their heroism?